NPR photo journalist David Gilkey and NPR Afghan interpreter Zabihullah Tamanna. We are here this morning to remember those we've lost, to honor their commitment and to rededicate ourselves to the principals they believed in and died for. 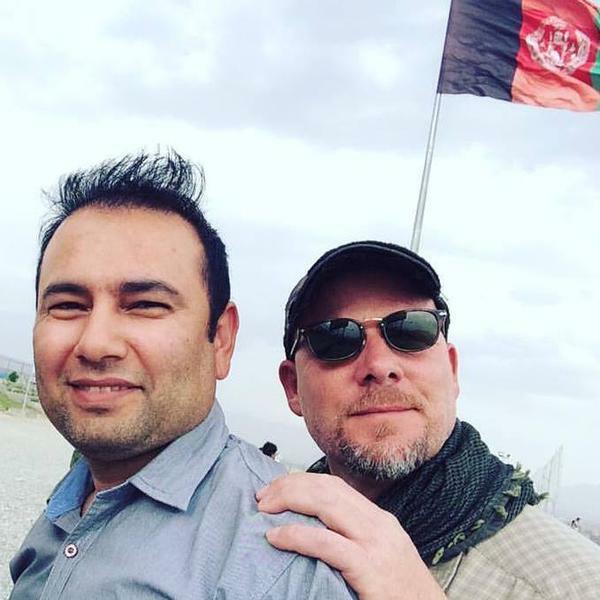 It was one year ago today that we in public radio lost two fine colleagues—NPR's chief photographer, David Gilkey, and our Afghan interpreter and fellow journalist, Zabihullah Tamanna. They died on a road in Helmand province. They were there doing the most fundamental thing any journalist can do. They were there to find for themselves the facts of America's longest war as the Afghan army took over the fighting. David is sometimes described as one of his generations finest war photographers. But that's not quite right. He didn't photograph war. He photographed the men and women, soldiers and civilians caught in these wars. Go look at his photos when you have a chance later. It wasn't battles he was capturing. It was people. Streaked with sweat, etched with exhaustion, or fear or relief. David's own humanity was reflected back in those images. He was a soulful bear of a man. He would often cut through tension with a bad joke or a teasing jab. He reveled in the irony of being the chief photographer of a radio network. And he never forgot the people he came to cover. "These wars are not over," he said. "We need to keep going." Journalism wasn't just a job. It was a mission. To David, to Zabi. Zabi was trained as a lawyer. He was, obviously, fluent not just in English but in all the local languages. And in Afghanistan, journalism was a more immediate way to help his country. So he and David teamed up. In a few minutes, staff members of this great museum will read the names of David, Zabi and 12 other journalists who were killed last year doing their jobs. You will hear how they died. I would like to try for a moment to speak about what they lived for. I have no right or special claim to be able to do this for them. Nor, of course, can my words speak more clearly or more eloquently than their sacrifice. Because they did sacrifice both in the life each of them lived and in the abrupt end that each of them knew was a very real risk of the path they had chosen. Why would anyone voluntarily choose a path like that? A path of relentless work. Separation from family. Steady conflict and threats. And the endless anxiety that at any moment your name might be called from the darkness, as Joao Miranda do Carmo's name was called that night. When Joao went out to respond he was gunned down at the gate of his home... shot at point-blank range in the chest. I wish Joao, David, Zabi and the 11 others we memorialize today were all still here to tell us why they pursued the life of a journalist. But they aren't. They lived the way they lived and died as they died because they believed in something precious and simple and profound. They believed that independent information in the hands of individuals helps make them free... that it empowers them to make decisions and liberates them from governments that would control them by keeping them ignorant. They believed that corruption and oppression thrive in darkness. They believed that knowledge is a path to a better life. And that their mission was to serve their neighbors, their communities, their countries and the world by helping to gather and spread the information upon which that knowledge could be built. Joao lived that so well. He saw his job as challenging authorities... he would as easily demand why a road wasn't paved or why the trash wasn't collected as why the drug trade continued to thrive in his town in Brazil. After his murder, one tribute read "shots at close range. That's what you earned for wanting to make your city a little less corrupt." Joao's city was Santo Antonio Do Descoberto. You probably haven't heard of it. It's thirty miles from Brasalia. Joao wasn't a globetrotting war correspondent. He worked and died covering his hometown. 12 of the 14 journalists we honor today were killed while reporting on their own countries. Joao, Zabi and ten others. For that is the brutal reality of the world we live in. Whether it is drug gangs and corrupt police in Mexico or the self-proclaimed Islamic state in Syria. Murdering journalists has become a technique of control. A way of trying to prevent reality from reaching the outside world. There is a claim these days that we live in a post-truth era. There is no greater proof of how wrong that idea is than the lives and deaths of these journalists. We don't live in a post-truth era. We live in an era where powerful organizations and governments know just how much the truth still matters... and they are willing to kill journalists—or jail or bully or threaten them—to keep the truth from being known. And we have to say no. The men and women we honor today understood that. They knew the risks they took to keep reporting. Joao had twice before told police he had been threatened. Zabi and David knew the war wasn't over. But he kept working, they all kept working, because the work mattered that much to them. But remembering is not enough. We owe them something more. As we rededicate this wall by adding their names, we must rededicate ourselves to the cause they died for. Because it is a cause. The right to gather and distribute the news... the right of every citizen to have access to free and independent information. That was their cause. The United Nations says this is a fundamental human right. It is the right on which so much else is built. The First Amendment to the U.S. Constitution, 45 words so important they are engraved on the wall of this building, dictates that the government shall make no law infringing on the right to speak or publish. Without this guarantee citizens would not have the information they need to pursue their own lives, liberty and happiness. They would not have a basis to decide with their neighbors what kind of community they wanted to live in. I say these journalists died for a cause because at this moment in history there are clearly those in the world who would prefer a very different system. Ideologues and autocrats and would-be autocrats know it's easier to get their way when they, and only they, control the information the public receives. But this works the other way too. Without the truth. Without independent, verified facts, freedom can easily slip away. In the world we have inherited, liberty is much more likely to be lost to ignorance, than to jackbooted armies. So to honor these 14 journalists we need to continue their crusade. We must resist efforts to limit the freedom to report–here or anywhere else in the world. If journalists are imprisoned, as they are in far too many places in the world, we must demand their release. If they are murdered we must demand the capture and trial of their killers. And we must always remember that America has stood as a light of liberty to the world. Attacks on journalists in this country, be they physical or merely verbal, sends a message everywhere that journalists are legitimate targets. That can never be okay. Later today the staff of NPR will gather for a moment of silence in our newsroom. I encourage you to find a place and time when you can be connected to why this memorial exists. What the cost of pursuing the truth has been for those whose names are here. The cost to the countries these journalists lived and worked in. The cost to their families. To their friends and their communities. To those who grieve today, please know that the entire public radio community—the NPR staff here and abroad, our member stations and our colleagues at the CPB and PBS, our donors and our millions of listeners across the country—share your grief and stand with you. We will carry forward the memory of these fallen journalists. Engraved on this wall and in our hearts as colleagues, as friends and family and as champions of our craft. Thank you.